Abstract: How did medieval builders manage to construct Gothic cathedrals—buildings which are still among the tallest structures in the world—without access to the modern engineering theories? The paper investigates medieval building knowledge and the way it was transferred across the generations. Printed information only seems to have emerged in the course of the 15th century. Construction drawings were limited to details. By implication, the relevant knowledge must have been transferred on a personal basis. Its underlying principles therefore must have been reasonably simple. The paper attempts to demonstrate that a modular design and execution was underpinning much of the construction work on large projects such as European cathedrals. By briefly considering building projects in the Middle East and Asia, it also suggests that this was probably true throughout Eurasia. Introduction: In the medieval Latin West, building must have been among the most important industries, constituting perhaps as much as five percent of the economy. 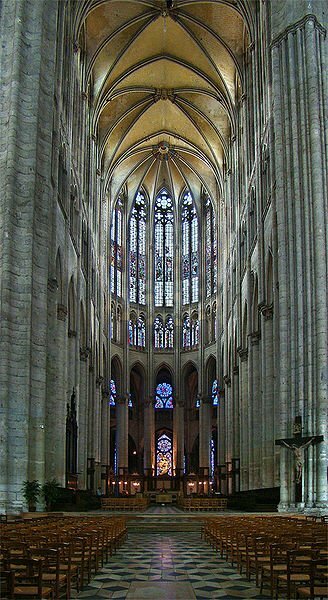 Between 1136—when building started on the new choir for the church of Saint Denis, north of Paris, presumably the first Gothic project—and the middle of the fourteenth century, medieval Europe was in the grip of what amounted to a building boom. Major projects continued to be undertaken in the following centuries. The products of this boom still amaze observers today. In many European towns the cathedral and other medieval churches are among the main tourist sights and keep attracting crowds of visitors who travel long distances to admire them. Even today, the cathedrals are among the tallest structures in many a European town.